It’s time for another round of Bookshelf Bingo! Today we are joining David Michael Williams for a glimpse at his shelves. 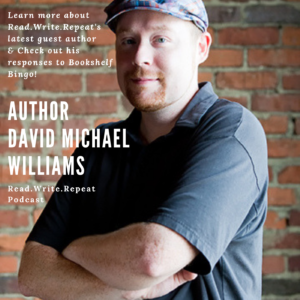 David is a guest on Read.Write.Repeat. Don’t miss his episode, which aired September 23rd! First, tell us a little bit about your normal reading habits. Q: Do you buy, borrow or steal the most of your books? Q: Describe your ideal reading setting. A: Honestly, I think it’s on an airplane. International flights, in particular, are great for guilt-free binge reading. And the book in my hand is always a paperback or hardcover novel. I just can’t get excited about my e-reader. Q: Kaisha can’t write in her books and I can’t get rid of mine once they are read. 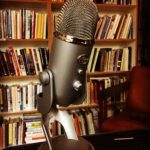 What are your book quirks? A: When I’m done reading a book, it looks almost identical to how it looked when I took it off the shelf at the store. No smudges on the binding, no creases on the cover, and certainly no dog-eared pages! Q: What is the most beloved book that you own? A: At the risk of sounding self-promotional, I’m going to go with The Pajamazon Amazon vs The Goofers Twofers. It’s a children’s chapter book my wife and I wrote as a labor of love, and our young daughter provided the illustrations. It’s also precious to me because it’s out of print, and very few copies are in circulation. Okay, here’s how the game works: Designate six shelves in your house 1-6. Find the correct book for each shelf and then answer the following about each book. If you don’t have the number of books required on the bookshelf (for example, if you don’t have 17 books on the shelf you designate as 2) then you can either take the first or the last book on that shelf. The Kinslayer Wars is the second book of the Elven Nations Trilogy within the Dragonlance saga. Many books, such as this one, provided cultural and historical context for some of the more mainstream stories in the Dragonlance setting. The history of the elves is entertaining, but there are probably other books I’d recommend first. Between Dragonlance and Forgotten Realms, I have a dozen or more stories written by Niles, and he always pulls the reader into the adventure. Terry Goodkind’s Sword of Truth series gave me my first glimpse into a grittier type of fantasy fiction. I very much enjoyed this book as well as the ones that preceded it, though I felt the series lost steam after this installment. I recommend the series up to and including The Pillars of Creation. Yes (though not from cover to cover). When I ordered this book, I expected it to be a bit more…well…robust. I doesn’t go too deep into the Norse myths, but I will say that the book serves as an excellent quick-reference guide. In fact, I used it while researching my latest sci-fi series. Yes, for those looking for a broad overview of the characters and plots of Norse mythology. I read this book when I was pretty young, and it freaked me out. I hadn’t read a book about spiritual warfare before that, and I don’t think I’ve read a better one since. Imagine that angels and demons are real and that they can influence our reality. This Present Darkness dishes out a dark and disturbing conspiracy. What made you buy the book? I bought it because I was required to read it for some college literature course or another. I’m pretty sure I started it, but it didn’t hook me. I can’t imagine how I passed a test or wrote a paper about it. CliffsNotes, maybe? What are you looking forward to about the book? I do not intend to give this classic another try. Wanna hear something weird? Sometimes I buy comic books and graphic novels because they look bad. The cheesier the title, the better. This one fit the bill if only because the titular character seemed so cliché. Imagine my surprise when it ended up being a very clever and engaging story that featured cameos from some rather big names in the DC Comics universe. Yes, for any and all comic book fans.